Andrew and Marguerite as an expression of their passion for pizza, local food and farming founded Switchback Pizza Company in 2012. In 2011, Andrew and Marguerite spent two months in Italy working on organic farms learning how to cook wood oven pizza and make traditional cheeses and pasta. 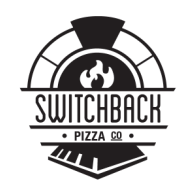 Returning back to the U.S. in the summer of 2011, they began working on opening Switchback Pizza Company. Andrew spent a year developing his two-day cold fermented dough and Marguerite put her own twist on the tomato sauce that was passed down to her by her father and grandmother. Switchback's mobile wood oven cooks the pizza in 90 seconds for you at local farmer's markets and catered events, bringing you a little bit of pizza magic. Andrew and Marguerite met after college in 2008 while serving a yearlong AmeriCorps term of service in Trout Lake, WA. They were lucky enough to spend a year working on the Pacific Crest Trail together as Team Leaders on a backcountry Trail Crew working from southern California to Central Washington. They shared a love of great food, conservation, and travel and were married in 2012. For more background on Marguerite and Andrew's experience learning how to make pizza in Italy, check out Working in Italy. Marguerite brings her entrepreneurial skills, 15 years of organic gardening experience and ardor for all things culinary to Switchback. Growing up in an Italian family, many Sundays were spent making homemade pizza with her dad and countless hours cooking with Grandmom Viola in hopes of someday recreating the magic of her Grandmother's cooking in her own kitchen. As a teenager, she operated her own plant nursery out of her parent's backyard, sold beeswax candles, and grew a huge organic garden in order to cook with fresh foods. Marguerite was an apprentice at the Seed Farm in Emmaus in 2012, honing her small farming skills while networking with the local farming community. 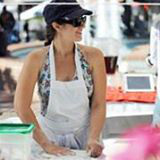 Her passion for small business, sustainable agricultural and dedication to great foods fosters Switchback's mission and growth. Andrew brings to Switchback a diverse and extensive culinary background. He has over 13 years of experience working in professional kitchens including working at a local pizza shop in high school, a chef at a sushi restaurant in Humboldt, CA and a French restaurant in San Francisco, CA. Andrew was lucky enough to first learn how to make cheese during a four month bicycle tour in New Zealand in 2008. While touring, he was a part of the WWOOF program that allowed him to spend many weeks on a farmstead making specialty aged cheeses. His creativity and passion for perfection is the driving force behind all the unique pizzas created every week for you to sample at our farmer's markets. Andrew's zeal pushes him to constantly try new things in the kitchen and to continue to develop his baking and cheese making skills.